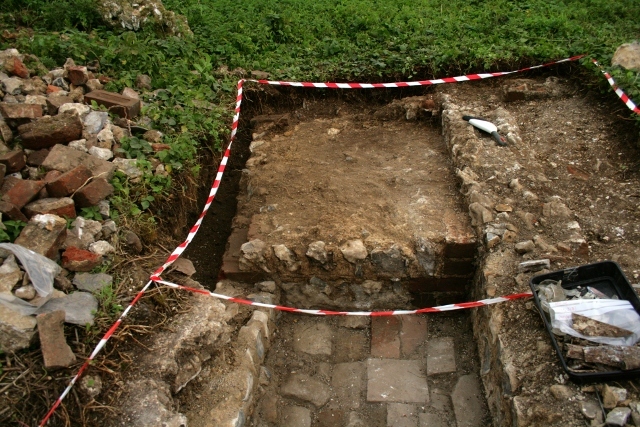 Looking S at an excavation of the east side of the concrete platform beyond the ‘woodstore’. Sunday we did an excellent job excavating and cleaning up the area encompassing the remains of the east side of the kitchen, the woodstore which butted against the first ~2m of its outer east wall, and the mystery concrete platform which butted against the rear of the ~1m wide woodstore, and against the last ~1.4m of the kitchen wall. It was good to discover the plan which we have was – in this case – just about spot on! Looking S at foundations of E & S walls of kitchen. Another discovery was that the internal wall which separated the cottage’s 2 downstairs rooms had a foundation of 1 brick width. This was completely unexpected. On the west side of the cottage the only survival of this internal wall above floor level was only a very narrow 1/2 a brick wide. Sadly this wall was almost entirely cut by the 1950 bulldozer. Looking E, down onto the N & E part of concrete platform & top of bulldozer cut S wall of ‘woodstore’. The mystery concrete platform was an integral part of the back wall of the shed. Looking S at concrete platform S of ‘woodstore’ E of scullery/kitchen. The east wall of the shed butted onto it. The concrete platform butted onto the kitchen wall. Brick quoins strengthened its corners, though the top/outer-most bricks and mortar were badly decayed. A 19th century Laundry Copper. Image from Wikimedia. One possibility I wish to explore is that it may have been the base for a built-in copper. The 20th century kitchen used to be a washhouse in the 19th century. 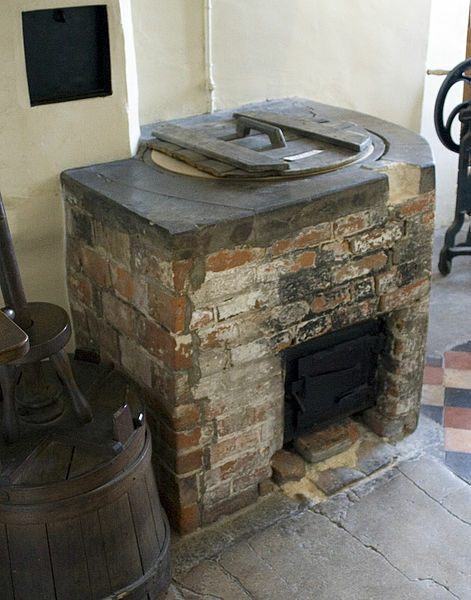 Many cottages had a copper to heat water for their laundry & for puddings. They were contained by large masonry structures, with a fire underneath. 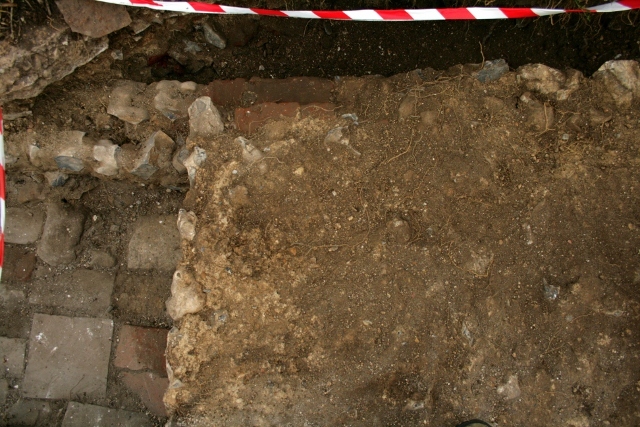 Many blackened flints, fragments of a circular cast iron grate, a decorative fire grate front, and part of a chimney pot have been found in its vicinity. 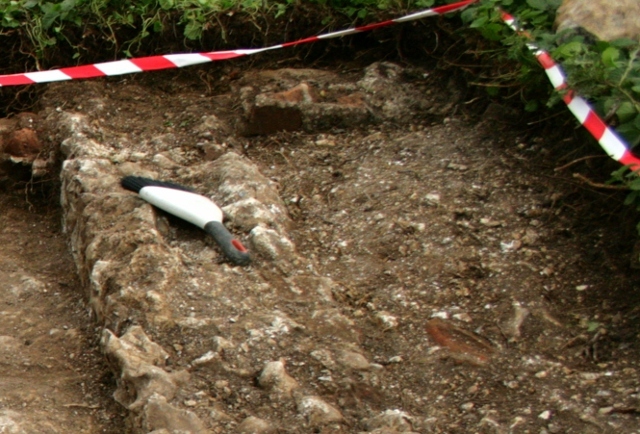 Nevertheless, these finds may have originated from the fireplace in the nextdoor room. Finds were less numerous than Friday – so less work processing and recording later! Ceramics included more shards of the beautifully decorated ‘foreign’ teacup and saucer with a house and flowery garden design. Two nice shards of blue and white, as well as two shards of a salt glazed stoneware storage jar were also found. Metal finds included the find of the day – the tubular battery compartment, including switch, of a torch. They were first invented in about 1899, but only really became popular by the 1920’s. Next Friday we return to the south of the house in search of the east wall of the ‘sort of lean-to conservatory’, and another possibility of a well. We would love you to join us – no experience required! 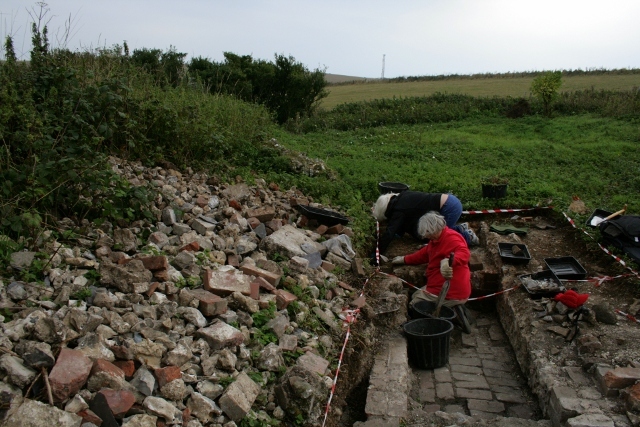 We meet at the car park near the junction of Bexhill Road and Falmer Road, just north of Woodingdean, at 10am, and if the weather is too bad to dig we are still happy to give a quick tour for anyone interested. Please don’t hesitate to give me a call for further info. 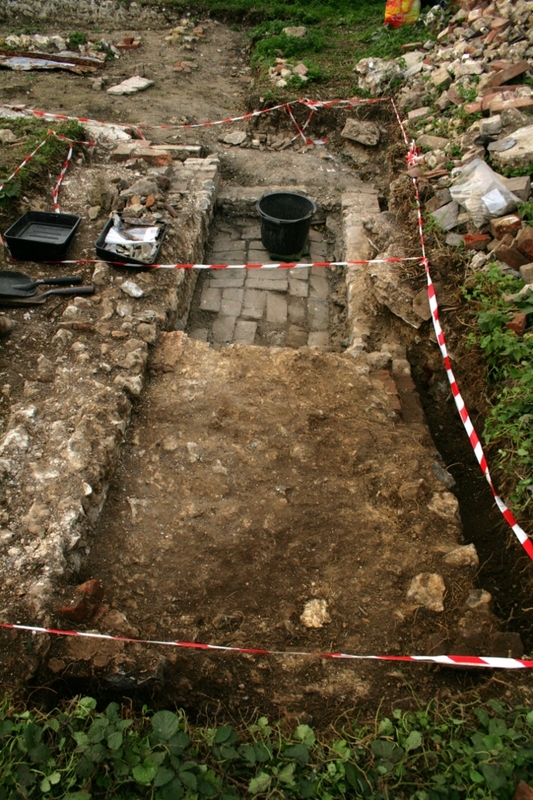 Also, our official guided tour of the site is on Saturday 2nd November, same time and place as above.